Note 1: This was the 7th win in a row for the Wanderers. Note 2: Mark Bridge scored for the fourth appearance in a row. Note 3: The crowd of 17,073 was the highest A-League crowd for a match not played against Sydney FC or part of an A-League final series. Record crowd anticipated for a normal season game. In recent days I have arrived at the conclusion that whats good for the game is good for my club, and vice versa. The final score is probably going to be "football 3 - RW 0". I drink to that. Cheers Bec. PS I recall the Nov 2013 game in the freezing cold rain. I witnessed how the VIC supporters where released from their pub in Parra by police and herded up to the ground like cattle. It was a shocking sight. The RBB has never seen anything remotely like it. Is that from a source inside WSW? Ticket sales would indicate that. And glorious to debut as walk out song. Games like these make me happy I signed up as a member this year. You'd think it would be a season-high turnout. A-League has been all over the media this week. Of course I would like us to win tomorrow but a part of me doesn't really care about the result. I think having a sell out crowd is a win for all football fans...hopefully the attendance at other grounds will be up as well. Yep, only work, births, deaths, marriages & Christmas parties are plausible excuses. Some news from our end - Valeri out for another week with this mystery illness. The Victory doesn't stand a chance as I will once again be wearing my lucky trousers. I was going to say unwashed of course but then I realised if you wear them to our home games they would get a nice drenching organically anyway! The weekly post match washing machine tour must put the magic back into the trousers. If we make 11 wins then I shall donate them to the yet to be established wsw museum. My take on the whole Derby matter - we're so lucky we're in a league that for a 10-team comp has some incredible rivalries. WSW/MV games also have an added edge in Melbourne purely for the off-field battles. Nothing like this exists against City, even though they're a bigger rival. Hard to explain the dynamic to someone that hasn't attended a game. You try telling a real Man City fan that they are the plastic team, when they spent their entire life supporting the "poor cousin" while Man U are followed by fans who their own captain said were more interested in eating prawn sandwiches than making noise, that's if they even live in Europe never mind Manchester! Comparing our derbies to the England ones - or any other games - diminishes our games. We have our own rivalries for our own reason. For example, the merseyside derby has many families who have split allegiances - some members of the family support Liverpool, some support Everton. I highly doubt that is going to happen in Sydney! I hate making comparisons with WSW are the this or that English team of the a league. We aren't the Liverpool the man utd (or even the Everton) of the a league. We are Western Sydney Wanderers! That's enough for me, we have our own culture and our thing. Leave the we are the man utd of the a league crap to Sydney. Thats said as you have made a merseyside derby comparison (and I have deep hatred of Liverpool FC that knows no bounds of bitterness) so I can't stop myself! In short to sum up my incoherent rant, if you made me compare (which nobody is) we are more Everton than Liverpool. To bring it back on topic. Pax tax ? This gonna be some game. Melbourne Victory rivalry is more to do with the support from both clubs. SFC rivalry is more to do with geographic and demographic reasons. There is more of a hate about what SFC stands for, therefore I would say the rivalry is stronger there. MVFC rivalry is ok with me as it doesn't have that real hatred and is usually a pretty amazing spectacle when both teams are firing. A far better spectacle than the SFC v MV one imo (even though there is more hate between those two). That's why I tend to enjoy these games more than the derbies against SFC. There is also something in that the demographic of their support and outlook on things from their supporters tends to be similar to ours. SFC and Heart/City are also more alike. ESFC = My hate for this sewerage has no limits, despise the mother****ers so much. I love to hate Berisha, a grub in every way, should have come to us, Home of the Grubs! One night at the World Cup we were drinking in the streets after a Socceroos games with the locals and a esfc guy who was walking past had to be pulled away from us by his mates because I had RBB on my jersey. We were ignoring him and continued talking to the locals. Two nights later we bumped into two Victory fans who were just trying to get wasted, watch footy and have fun like us, and they called us 'frenemies'. Sums it up for me - one a group of try hard wannabee tough guwankers, the others you respect but hate for 3 days a year. I can't remember being more excited or keener for a WSW match than this one. I'm not sure why. I've been there since before match 1 S1. The past couple of weeks and the outcome and "return to normal" is an obvious factor but there's more to it than that. Thinking about it as I write, another factor is feeling less concerned about what the police might do. Hopefully those around me in bay 7 (and elsewhere) will be much more active than usual this year and the poznan will be back to its best participation rate right around the stadium. COYW - Bring. It. On. I did say I can't remember! It was a different anticipation then. Maybe I was more worried with the higher stakes. This time there's a sense of relief or release mixed in with the anticipation of the match itself and all that will go with it and being at Wanderland with my Wanderers family to partcipate with all the gusto I can muster (that will be accepted by those around me in the sit down seats). I was obviously excited for the champions league but somehow this time is different and certainly more relaxed and easier to allow to wash over me. I'm taking my dad to his first Wanderers game tomorrow. I thought I would try to give him the best possible experience outside of a derby. He's a big rusted-on AFL fan but my sister and I have slowly been converting him over the years. He now watches all our games on TV while we're at the ground and discusses them with us when we get home. A few days before last week's match, he asked if we were boycotting. I said yes we were, and I was getting ready to be told we were being stupid for doing it because my dad is very straight-laced. To my total surprise, he said it was good we were doing it and that the FFA needed to change the system. He was also pleasantly surprised to see the terrace empty. I don't think he realised how big the boycott was going to be. Anyway, In + 2 and hopefully a new convert! Hey CaptainJess, give us an update after the game. It would be great to hear how it all went. Let us know if he has enjoyed it. any chance of giving Copa90 a last minute call out? 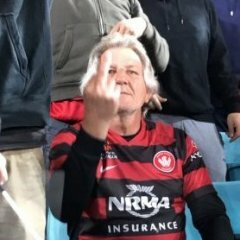 I'd even go so far to say work or deaths only...and even then I would question work..
WSW has put extra North-East GA seats up as the south end has now sold out for the first time this season! FIRE UP, biggest non-derby regular season crowd at Pirtek coming up. Any idea how many Mexicans travelling North Victory? We've pretty much sold out a full bay of 300-400. Going to be huge. Tomorrow night's game, with a great view of the travelling Victory supporters ...from upstairs Western stand.... will be one of the few games I'll be happy to be down that end. Not that I wouldn't rather be up the other end..... but.... you know what I mean. Should be a bit of a spectacle in the Away Bay.....for a change. I'm there. I'll be the one in the red and black. Goes a bit nuts when we score and crushes the nearest of his kids. Loves it when the ref makes bad calls and has to self sensor. I can't remember being more excited or keener for a WSW match than this one. I'm not sure why. I've been there since before match 1 S1. The past couple of weeks and the outcome and "return to normal" is an obvious factor but there's more to it than that. Thinking about it as I write, another factor is feeling less concerned about what the police might do.Hopefully those around me in bay 7 (and elsewhere) will be much more active than usual this year and the poznan will be back to its best participation rate right around the stadium.